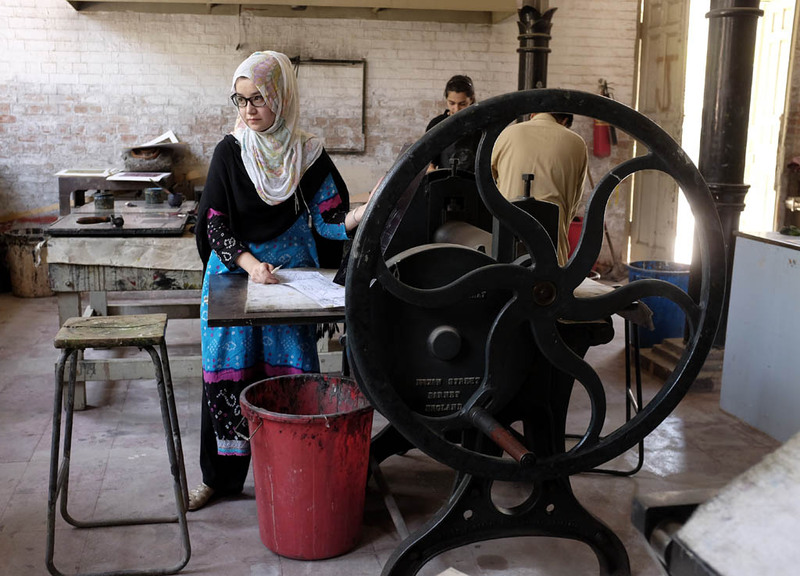 A few days ago I wrapped up a series of documentary photography workshops at NCA in Lahore. In addition to traditional arts the school offers a major in graphic design, visual communication and interactive media. Despite the heat and it being finals week we had a motivated group and explored the old walled city. I was glad to see that the students weren’t at all intimidated in photographing strangers in the bustling streets. As always, the Lahori’s were good sports about it and took it all in stride. I was very lucky to stay at the Avari Hotel in Lahore. It was an oasis where I could return to edit my photographs and recharge my batteries before going out into the walled city or teach at NCA. On my second day there I met the duty manager Atif Umar. Coincidentally, Atif was on a Fulbright in the United States a few years ago. He studied hotel and hospitality management at Highline Community College in Des Moines, Washington, just south of Seattle. It must have been a pretty good program. The attention to service and details at the Avari was something I had never experienced before. My driver in Lahore kept mentioning electric-city and after the third day it dawned on me that he meant electricity or I should say the lack of it. The city is experiencing a thirty year record breaking heat wave. It was 47c yesterday (that’s 117). People are without electricity for up to twenty hours a day and many are sleeping out on the streets. It’s been a disaster at several of the hospitals where they have cancelled operations for days on end. Shahid, a journalist who has been showing me around the city only got two hours of sleep last night because of the heat- and he has two small kids. Everywhere in the city people are waiting in line to purchase blocks of ice. Both government and independent power plants are being strained which makes matters worse. Many believe that the scarcity of electricity is partially driven by politics and when the new Prime Minister takes office next month the power supply will resume and he will take the credit for it. Founded in 1872, the National College of Arts is the oldest arts institution in Pakistan. I’ve made so many photographs on campus that I’ll be dividing them into several separate posts. For the past week, I’ve also been leading a documentary photography workshop here. More on that later. I love the intensity and talent of these young artists like Rabia Ehsaan from Karachi, megalopolis of over twenty million people. In her painting below she contrasts growing up there with the greenness of Lahore, a city of only ten million. Everything is relative. Her color palette and perspective stopped me in my tracks. In the painting studio several others were absorbed. The young artist Ali Talpur from Sindh, one of the four provinces in the southwest of Pakistan illustrates student life- waiting in line at the cafeteria in NCA . An installation by a young artist from Karachi in it’s early stages. She used fishing tackle line to create the kind of texture that I love to shoot through. A few images from the Architecture department of art imitating life on the campus. If you judge a country by the number and quality of it’s newspapers then Pakistan isn’t doing too badly. This morning I stumbled upon a street in Lahore where dozens of newspaper delivery men came to pick up their papers. Most of them used motorcycles but some had so many they needed an auto rickshaw to cart them away in. Funny how the smell of the ink brought back memories from many years ago in Brooklyn when I had my first paper route. I remember sorting the sections of the Sunday Times and stuffing them in my canvas sack. Here in Lahore my morning copy of The Tribune is left at the door of my hotel each morning also in a canvas bag. The Tribune is owned by the Daily Express media company and is partnering with the International Herald Tribune. It’s a five star newspaper and costs 19 cents. What a quaint and civilized way to start the day reading it over breakfast. The temperature in Lahore hit 112 degrees today but it’s a dry heat. Unlike most Pakistanis I don’t have to deal with lack of electricity (load shedding) for a up to fifteen hours a day. That would make life (to say nothing of related health issues) a real challenge. My only minor inconvenience is losing the draft and having to redo the text for this blog post. I took my photography class out to make photos in the old city this afternoon. What a surprise to find this park and playground in the middle of the walled city just down the street from houses over 150 years old. The children’s play structure looked like the one in Portland packed with families escaping the heat. I wish that our media would report on stories about everyday life here. What could be more universal then a parent taking their kids to the park for a bit of fun and relaxation on a Sunday afternoon? There are over two and a half million Christians in Pakistan. They are the second largest minority here after the Hindus. The three communities that I visited had a similar look and feel to them: a maze of alleys- some barely wide enough for two people to pass at the same time. We stopped by for a visit on election day and compared to the rest of the city it was bustling. When I returned last Sunday. Many people were packed inside of a church (that was funded by the Salvation Army). It was an evangelical service and the music sounded very Indian with plenty of hand clapping. Sometimes you meet a person who stops you in your tracks. That’s what happened to me when I met Simi, an 18 year old young women who is is doing advocacy work around women’s issues. She was recently invited to attend a conference in New York City with other youth from around the world. Now back in Pakistan she leads a street theater group who helps get the message out.